This Fincrowd review proves that this program is a binary options scam. It is presented by Sam Maxwell. Maxwell claims that he created a software that can make you thousands of dollars per day. It is called Fincrowd app. It allegedly is based on crowdfunding. And because you can get the Fincrowd App for free, you can become rich for free. Can you? The truth is that Fincrowd is a very simple scam that will not make you any money. In fact, it will take your money and lose it. Be it Maxwell, Petrov or any other person you see in the Fincrowd video, they all are just actors. This Fincrowd thing is complete fiction, there is no real company behind it, it is completely anonymous. These people have never made any money with this app, they are just lying in front of the camera. You don’t believe it? Check the Fincrowd disclaimer on the picture, they admit the sales video is fictitious and that they used actors! Moreover providing a trading app is a regulated activity in all countries with a financial regulation. So the Fincrowd app is illegal in all those countries, because it is completely anonymous and not licensed. Now it is also clear that all Fincrowd testimonials are fake. 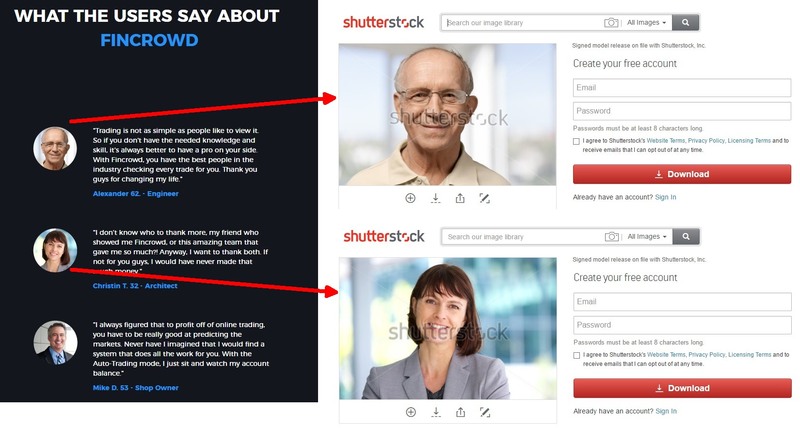 In the video you see actors and on the website you see stock photos. Look at the picture to see a proof. These stories are not real, there are no people making money with this app. On the Fincrowd website you can read that the app won several awards over the years. The problem is that the Fincrowd website exists only since March 2017, so the talk cannot be about years of existence. Another problem is that their so called top broker is Ivory Option, which is an unregulated broker that we hear complains about. So what is the Fincrowd App really about? After registering they will push you to deposit at least $250 with this unregulated broker – Ivory Option. This is because they get paid by this broker for referring new depositing clients. That’s the whole mechanism of this scam. And you can be sure that if you deposit your own money and let Fincrowd trade with it, you will lose it. Fincrowd is a dirty scam that will take your money and lose it in trading through a worthless software. Stay away from it! If you want to learn to make real money with binary options, start on a free demo account with a regulated broker. Build your own strategy on the demo and only then start investing your own money.